These savory biscuits are perfect for the kid’s lunchbox and are easy enough for them to lend a hand. They’re a great treat without being junky and this recipe is incredibly easy to alter for a more “adult” version. Besides the lunchbox, they also make a accompaniment to dinner with friends! 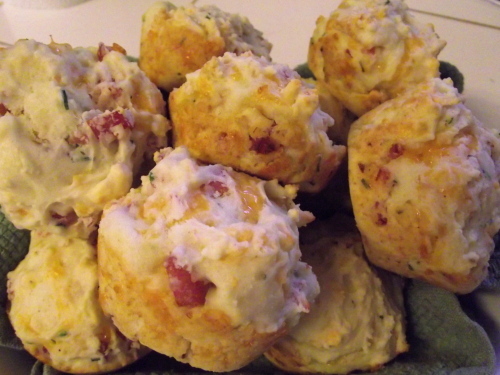 Try subbing out the ham and cheese for asiago and sun dried tomato or gruyere and panchetta. Mix together all but egg, milk and oil. In separate bowl, whisk together milk, egg and oil and pour into bowl of dry ingredients and mix gently until just blended- do not over mix. Spoon mixture into either paper lined or greased muffin tin (just over half full as they will rise) and bake for 20- 25 min at 350. Makes 12 regular sized biscuits.